En-vogue cut with a unique color. 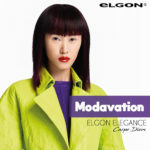 Elgon has created a supremely versatile toner especially for you: Violet 977. With Violet 977, the colorist is able to freely express their creativity: they need to simply vary the setting times and the volume of oxygen used on previously bleached hair to create extremely ‘pop’ plays of color and dimensional highlights. Violet is a cool and extremely on-trend color that provides the wearer with both character and allure. Violet 977 is part of the Moda&Styling permanent cream color cosmetic line that bleaches and dyes, thanks to its oxidising formula, for a full and vibrant effect. Elgon has also added a new product to this line: SILKER COMPLEX 3® PLUS, the new silk protein-based complex that ensures intense color that lasts even longer, with maximum coverage of grey hair. The reconstructive action on the cuticles restores the health and strength of the hair. What do our M&S experts think about Violet 977? “Violet 977 is a suggestive color that is difficult to achieve on the hair. The Moda&Styling formula makes it possible for this vibrant and audacious shade to enliven bleached hair for a truly stunning result”. “Our customers in Australia have literally gone wild for this color! This particular shade of violet is not just one of this season’s en-vogue colors, but is in fact entirely unique; it is so awash with pigments that it invariably translates into a fabulous color result every time. Violet 977 is a brilliant addition to any salon. It is never monotonous and can be mixed in so many different ways that the looks to be achieved are simply infinite”.